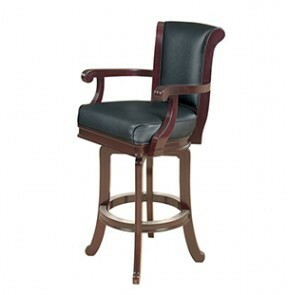 The traditional styling of this bar stool blends well with your favorite billiard table and furniture. Features include swivel mechanism that allows for easy side-to-side movement, seat height of 30", and antique brass (shown) and brushed nickel footplates. Available in traditional cherry, chestnut, and espresso, finishes. Matches the Centennial Bar.